If you’ve heard it once, you’ve heard it a million times: drunk driving is a horrible idea. Even with multiple campaigns and the majority of people knowing the risks associated with drinking and driving, thousands of Texans lose their lives at the hands of drunk drivers each year, with many others suffering injuries from which they may never fully recover. Did you know that Texas is ranked in the top 10 states that account for the highest number of DUI-related fatalities, going to show that this problem is not becoming any less prevalent in our state. 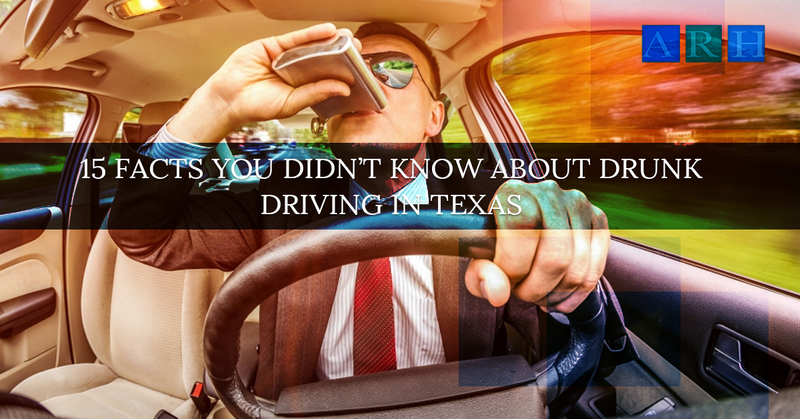 In order to express the severity of this problem we have put together a list of some of the most shocking and eye-opening facts and statistics about drunk driving in Texas. There were an estimated 1440 Texans were killed in drunk driving accidents in 2015. When someone gets behind the wheel while intoxicated, they are making a decision to put countless lives in danger. This negligent and reckless act unfortunately happens far too often, however. If you or someone you know has been injured in an auto accident that involved a drunk driver, you need to understand what exactly your rights are. When you hire a Texas personal injury lawyer, you can seek the compensation you deserve for the damages you have experienced. If you are in need of the assistance of an experienced and passionate personal injury attorney, it’s time for you to call the expert team at Alex Hernandez Trial Law. We would be happy to answer questions you have about your case and even happier to be able to represent you. Contact us now to find out what we can do for you!